Top-performing Temple University MIS Students got to see the inner workings of two global companies in November. Pharmaceutical distributor AmerisourceBergen in Conshohocken, Pennsylvania, and educational publisher Scholastic Inc. in New York City, were the inaugural hosts of the Institute for Business and Information Technology’s (IBIT) Company Visits initiative. These visits bring together business leaders and students at the sites of IBIT members. For a few hours, students tour offices, learn about projects a company is working on, and talk with employees about their careers. It was amazing to sit at the same table with high-level executives and hear them speak about their experience. Overall, the site visit allowed me to expand my knowledge about the [healthcare] industry as well as my network said MIS student Anastasia Postolati. Learning how Scholastic Inc. uses technology in publishing showed how diverse a MIS grad’s career options truly are, said Madison Collins. The November hosts worked closely with IBIT to design their visits, which are also recruiting opportunities. Only students with excellent academic and professional development experience are invited to participate in Company Visits. It was an absolute delight and inspiring to host the students. They filled me with hope and optimism for the future as prospective leaders of our communities, our businesses and our domestic economy,” said Dale Danilewitz, AmerisourceBergen CIO. 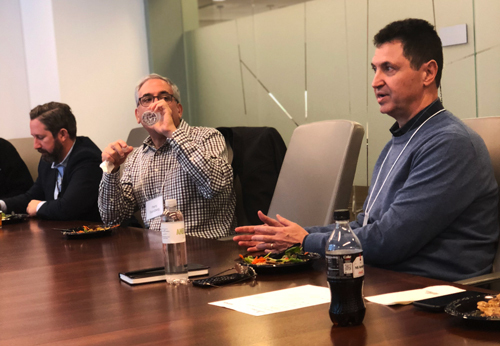 Danilewitz, who sits on IBIT’s IT Advisory Board, also said that the students were inquisitive and informative and displayed an air of confidence and sincere appreciation for the opportunity to meet our company leaders while engaging in productive and thought-provoking conversation. They are welcome back any time.